CLEA created the Best Practices Committee to develop strategies for persuading law schools to implement best practices for legal education. We offer presentations on best practices in pedagogy at regional and other conferences, remote webinar series, as well as disseminate information highlighting CLEA’s resources on best practices for legal education through our website, the Best Practices Blog, and other means. The Committee is co-chaired by Laila Hlass (Tulane, llhlass@tulane.edu) and Melanie DeRousse (Kansas, melanie.derousse@ku.edu). If you have any ideas that might help the Committee succeed, they would be glad to hear from you. Teaching Justice Webinar series features innovative faculty discussing new approaches to teaching justice in the classroom. Each session will draw on the wisdom of current resistance movement and examine its intersections with criminal justice, immigration policy, racial justice, economic justice, and international human rights, among other issues. For more information about past or future webinars, click here. 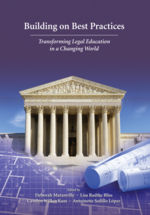 The book, Building on Best Practices: Transforming Legal Education in a Changing World, was developed as a part of this committee, and it addresses law school missions, creating a balanced curriculum, and pathways, integration, and sequencing the curriculum. For more information on how to purchase the book or view chapters, click here. CLEA initiated a project to develop a statement of best practices in 2001 by appointing a steering committee chaired by Roy Stuckey. Each new draft was posted on the internet and suggestions for improving the document were widely solicited. Many people made suggestions, and some even drafted segments that were incorporated into the document. As the document evolved, presentations about it were made at a variety of meetings and conferences, and the document was the subject of a national conference at Pace University School of Law in March 2005, as well as several CLEA-sponsored workshops. For more information and to view chapters, click here.